Peleg Wadsworth was Adjutant General for the State of Massachusetts during the Revolutionary War. Wadsworth also served as a Brigadier General in the State Militia and Participated in the Battle of Penobscot Bay. Although there about ten different Wadworths involved to various degrees in the American Revolution, this will be the third and final family member we cover (at least for a while). I decided to write about Peleg Wadsworth mostly because I am a big fan of his grandson. Perhaps you’ve heard of him. Henry Wadsworth Longfellow. Henry Wadsworth Longfellow grew up in the house Peleg built, the oldest brick building which still stands in Portland, Maine. But we’re getting ahead of ourselves, lets go back to the beginning. Peleg Wadsworth was a Harvard graduate and a schoolteacher before he rallied to the Patriot Cause after the Battle of Lexington and Concord. Wadsworth heard the call of his country and helped put together a militia. These men soon thereafter elected him as their Captain. Captain Wadsworth participated in several minor skirmishes around Boston during the first year of the war before journeying to New York for the Battle of Long Island. Peleg was then promoted as a Brigadier General in the Massachusetts Militia. Massachusetts realized his capabilities and selected Wadsworth as Adjutant General of the State. This position was basically the equivalent to CEO of the Militia. Peleg was responsible for the administrative duties of the entire State’s forces. Peleg Wadsworth’s most notable part of the Revolutionary War was as a bright spot in an otherwise disastrous battle. In what became known as the Penobscot Expedition, the American forces tried to overtake Fort George in modern day Maine (which was then a county in Massachusetts). Wadsworth led the soldiers while Paul Revere, in his only major engagement, was placed in charge or artillery. Additionally, there was a large group of Continental Navy vessels in the harbor for support. Unfortunately, the ships refused to fire at the fort and, when British vessels arrived, were chased upriver and destroyed. This was the worst loss by the American Navy for more than a hundred and fifty years…until Pearl Harbor! Wadsworth, for his part, was left stranded but manage to lead his men through the Maine wilderness to safety. After the war, Peleg Wadsworth returned to Maine where he became an early leader of modern-day Portland. He built a successful store as well as surveyed and invested in a significant amount of land. Furthermore, Wadsworth was elected to the United States House of Representatives, coinciding with President Washington’s second term. He would spend the better part of fifteen years in this position before retiring to focus on the local politics of his then-small town. Thanks for reading! If you are interested in reading further about the Revolutionary War in Maine, you will probably enjoy my article on Jeremiah O’Brien. 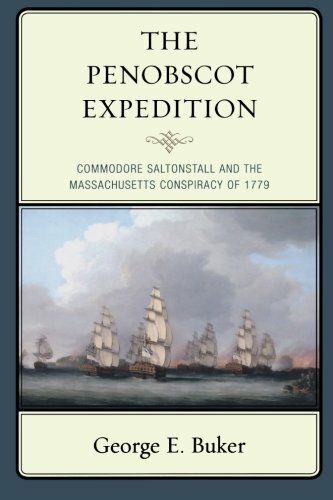 If you’d like to learn more about the Penobscot Expedition, pick up a copy of the aptly titled ‘The Penobscot Expedition’ from the affiliate link below. Although Amazon pays me a small commission, it does not effect your price but helps me defray web-hosting expenses. If you enjoyed this article, you might want to subscribe to my email list as I publish a new article every day.